The original Pentax 645 was released in 1984, a full fifteen years after the famous 6×7. Both cameras were quite unique at the time. 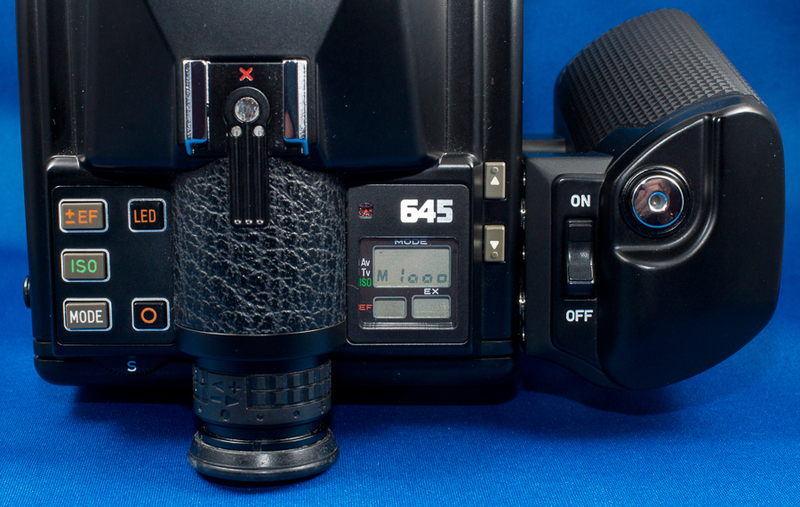 In a world where most medium format cameras were either TLR, rangefinder or fully modular the 6×7 was an exception because it looked and worked just like an oversized 35mm SLR. 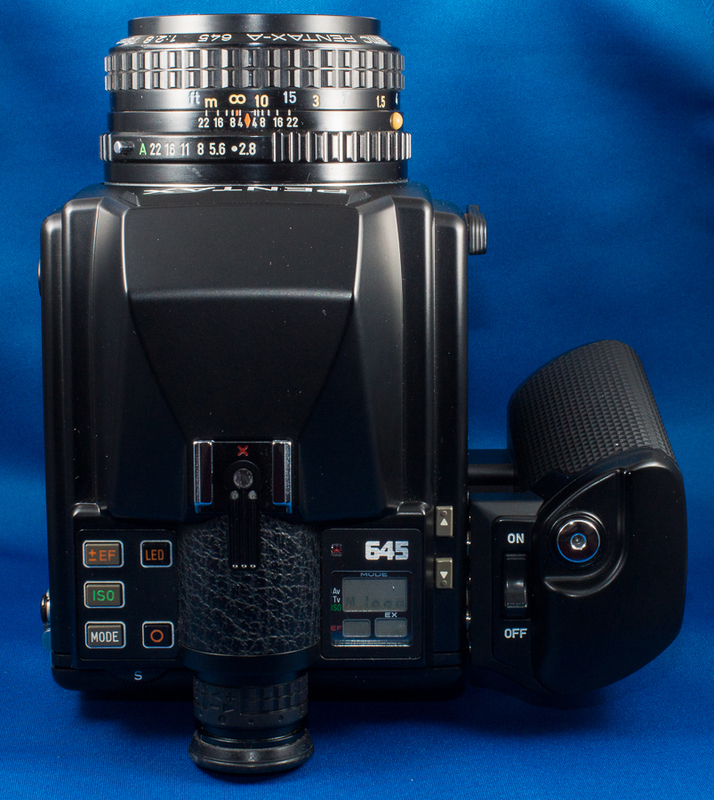 The 645 was also unique because it was an SLR but it wasn’t modular. No exchangeable film backs, no view finder options, a grip that is removable but without which the camera is inoperable; the only exchangeable components were lenses, focus screens and 120 and 220 film inserts (but not mid-roll). After having this collection for a couple of years I finally figured out why the grip is removable. There is an external battery pack shown in the photos below that can replace the grip via a cable and you keep it in your pocket to keep it warm in cold weather. 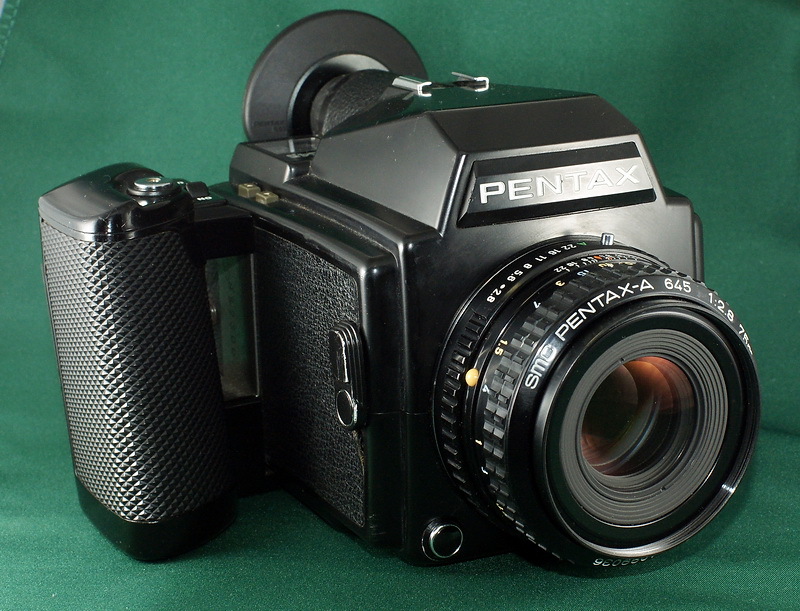 The Pentax 645 is similar in size and shape to many of the modular designs such as Mamiya, Contax and Bronica but in practice it works more like a modern SLR. It has a built in motor drive, Auto, Aperture Priority, and Speed Priority modes and many other modern functions. 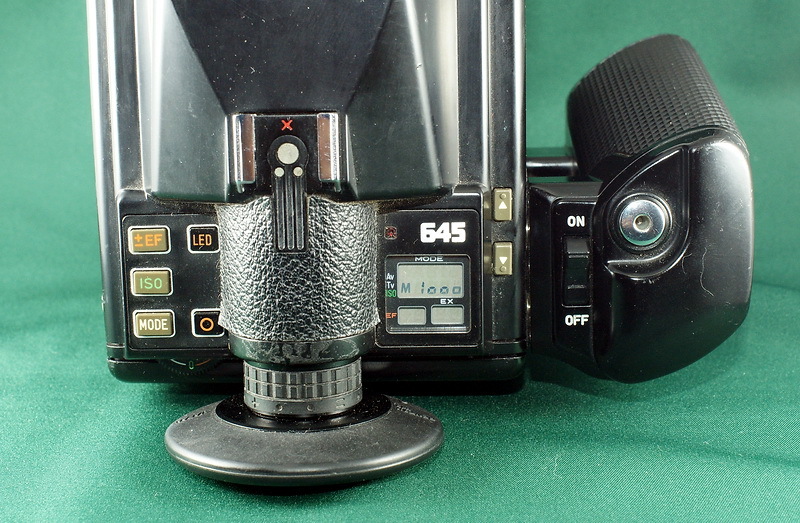 Various settings are accomplished with the help of two large rectangular buttons with Up and Down arrows on them, similar to the famous Minolta 7000 that was released the year after this camera. 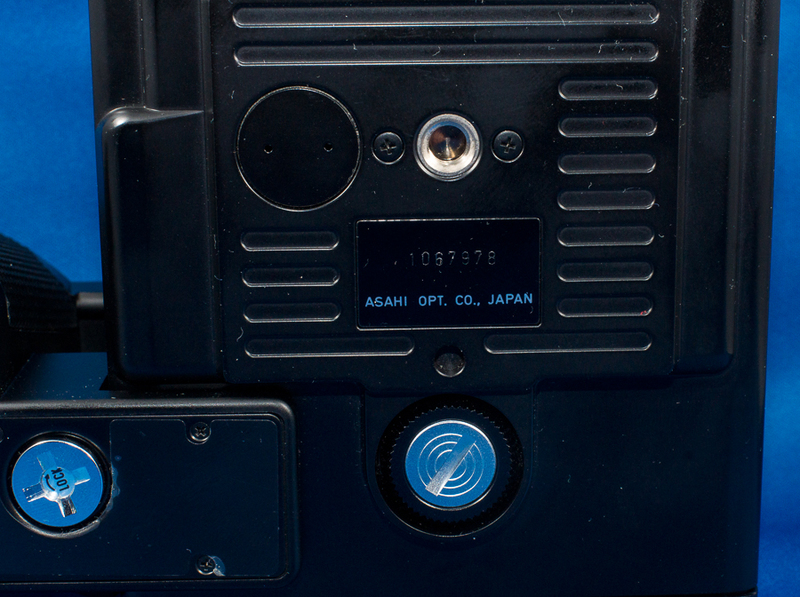 This was a new design trend at the time, but one that ultimately was replaced by dials/knobs and small round buttons. Everything about the controls on this camera is very retro. The On/Off switch resembles an old fashioned rocker switch virtually identical to a household light switch from that era. The rest of the controls are rectangular buttons that remind me of the first calculator I ever bought, back in the seventies. Pentax designed the A-series of manual focus lenses for this camera and had a full lineup from the wide angle 35mm to a 600mm telephoto behemoth. 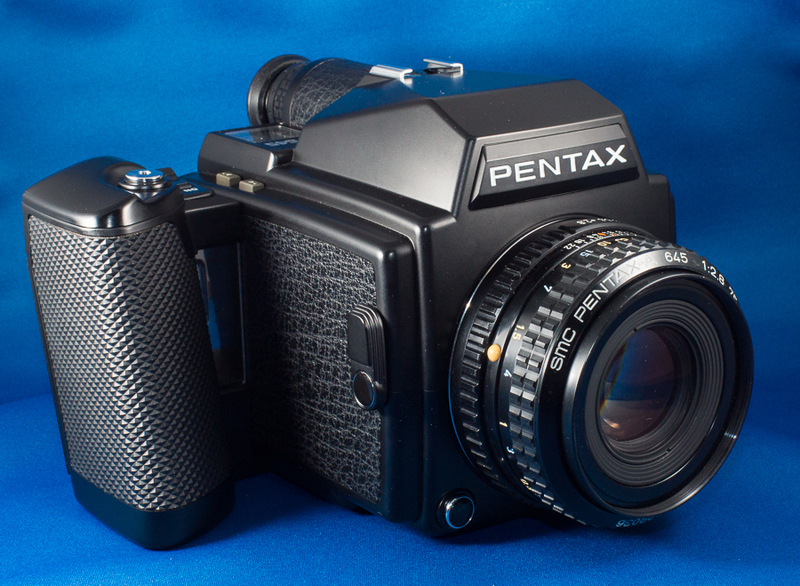 Pentax sweetened the deal even more with an adapter that allowed 6×7 Pentax lenses to be used on the 645 body. 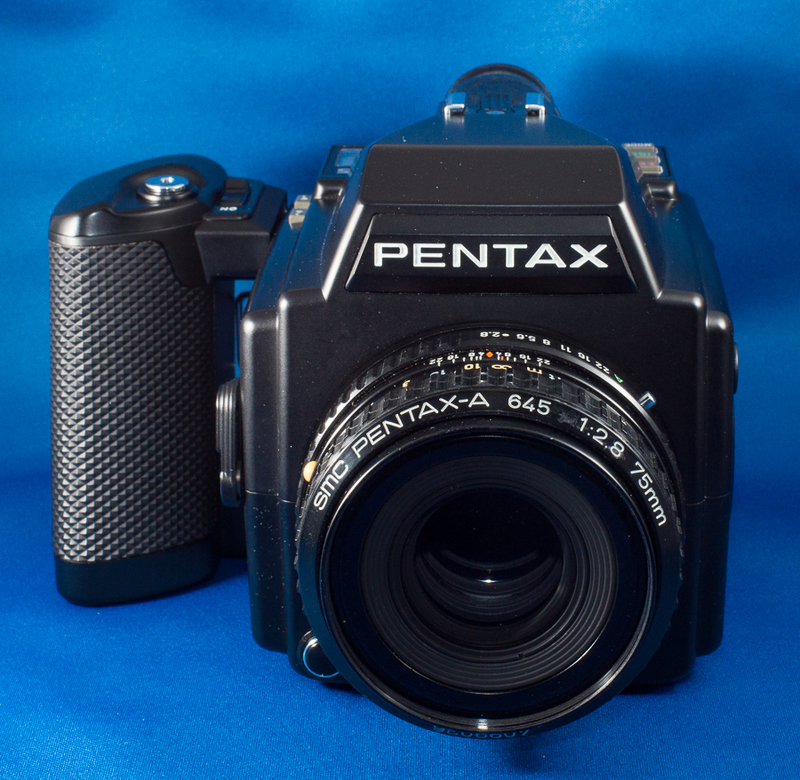 In 1997 Pentax released the 645N which was another ground breaker as the first auto-focus medium format camera. In 2000 they released yet another minor upgrade, the 645Nii, and in 2010 the long awaited digital 645D. The original lenses can be used with any of the bodies mentioned above and continue to be in demand on the used market. The camera pictured above was my second Pentax 645. 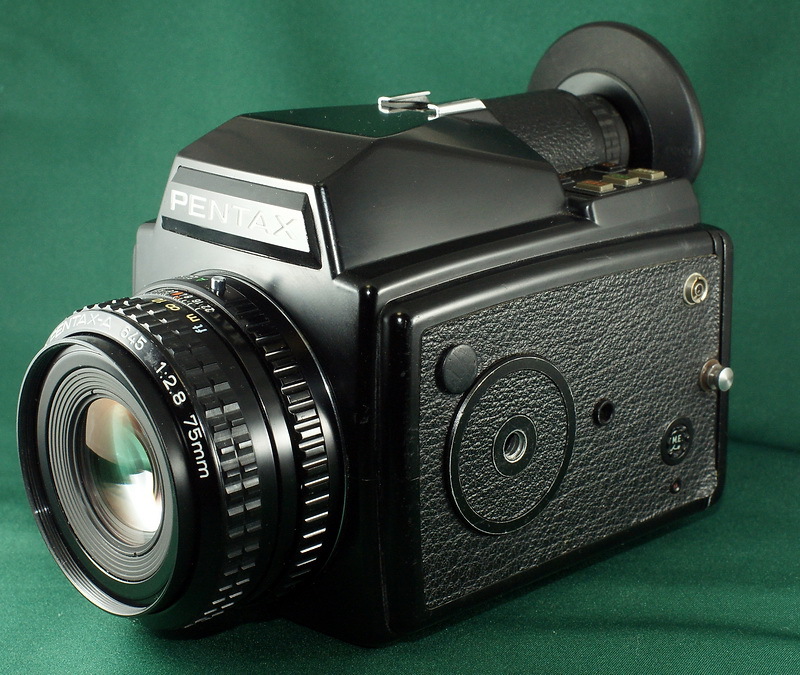 I sold the first one to raise money for the Mamiya RB but then often wished I still had the Pentax. When I saw another one for about $35 I simply couldn’t resist. The real attraction was that it has undergone an aftermarket upgrade in which the drive mode dial that originally selected single or continuous frames has been converted to offer EV compensation in half-stops. This camera originally came with an EV comp function but it was in full stops only so if you really wanted fine tuned compensation you were forced to play with the ISO setting. With the upgrade half-stop comp is possible. On August 24th, 2011 I sold the second 645 back to the store and bought the 645N in its place. Believe it or not they gave me close to $100 for the 645 that I bought from them a few months earlier for $35! I had cleaned it up a little bit and the sticky mirror had taken care of itself with a little use. I then gave them another $175 or so and came home with a very nice looking 645N! And then a few months later I picked up yet another working 645 for about $35. I’ve made money on the first three so why not? The funny thing is, I can’t remember what I did with that one. I must have traded it in when getting either my Fuji GF670 or the Mamiya 6 kit, but honestly I don’t remember. I just know it isn’t in my closet any more. Some would say this is evidence of having too many cameras… Hogwash! 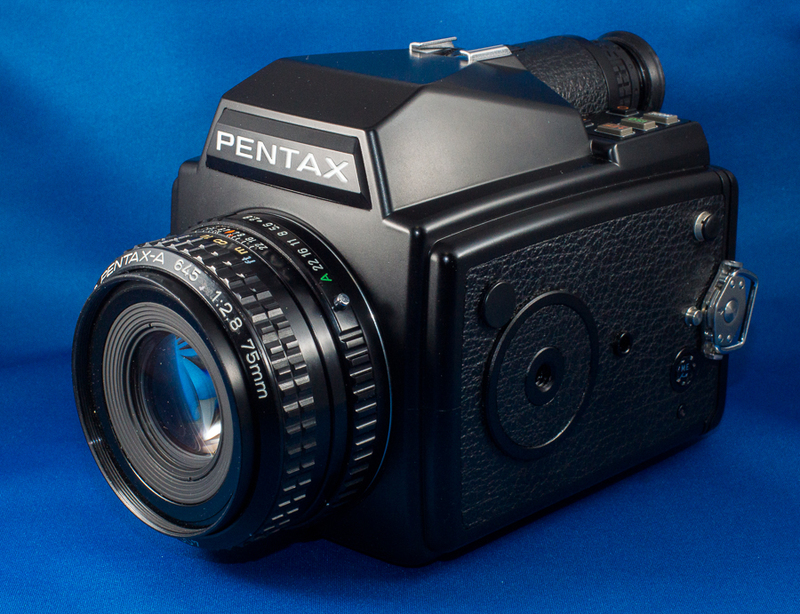 On May 26th, 2013 I bought my fifth Pentax 645! This time it wasn’t in the junk section, but actually on the shelf. It was ranked B, which is about as low as that store will go before putting it in the junk section. But the only issue listed on the price card was a fogged viewfinder. I checked and couldn’t see the fogging. Then I handed it to the clerk and he couldn’t see much either. The crazy thing is that the body is absolutely pristine! Looks like it was never used. There isn’t a single mark or micro-scratch around the tripod hole! Go figure! I have no idea what I will do with this camera, but it only cost 6,300 yen ($60) so how could I resist. I’ve gotten more than that on every single trade-in so far! My fifth P645 is so pretty that I decided to post a few photos of it. My lens collection for this camera and the 645N consists of the 35mm f/3.5, 55mm f/2.8, 75mm f/2.8, 120mm f/4 macro, 150mm f/3.5, and 200mm f/4. I have yet to pay more than $100 for any of these lenses except the 35mm. I initially bought the 45mm but then traded it in when I got the 35mm, which is a superb lens. I’m not really interested in the longer telephotos (300mm, 600mm). Of the two zooms, the shorter 45-85/4.5 appeals to me more than the longer 80-160/4.5 but I’m still undecided. The shorter zoom was one of the last lenses of this series, if not the last one and the production run was much smaller so it tends to be a bit more expensive. But the IQ is said to be quite outstanding, to the extent that some say it outshines the 45mm prime at that focal length. And while there are a couple of leaf shutter lenses available they are more expensive and given my huge Bronica lineup I really don’t see the need to spend more money on leaf shutter lenses. At some point I may pick up the 2X teleconverter which works with all the lenses but I doubt I’ll get the 1.4X teleconverter because it only works with a few of the lenses. Here are some photos taken with this camera. Picked up my 6th 645 for a few hundred yen because the store clerk thought it was broken, but it works just fine! Kind of ugly but who cares at that price. I’ll be trading in both of them when I get the 67ii! Do you know where I can find a new battery compartment grip? ?